Are you counting the days till summer arrives? Can you not wait till your next holiday trip? Are you living and breathing for your next adventure? Then you are reading the right article! 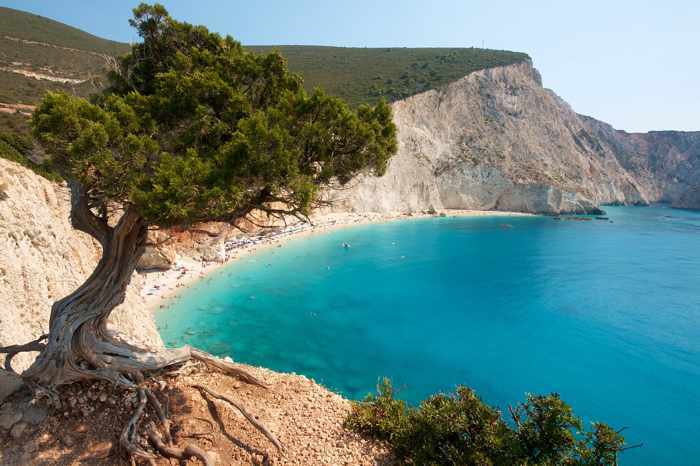 Since we know how important and desirable it is for you to swim in crystal clear waters, we have chosen some of the top beaches you can find in Greece — the country where the sea, sun and summer are taken for granted! Follow our guide and get ready to have the most remarkable beach holidays! 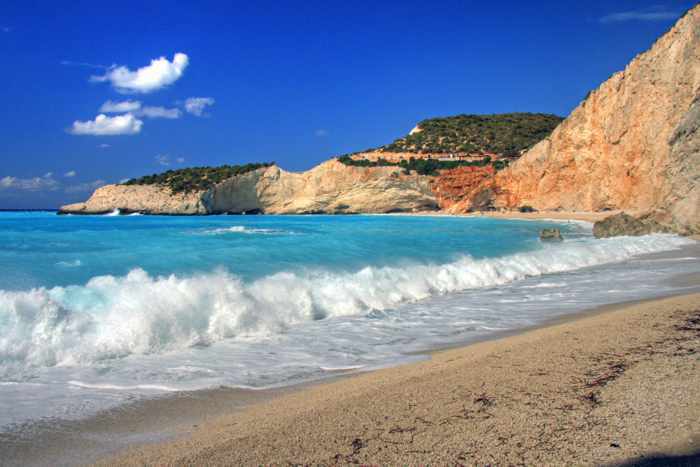 This famous golden sandy beach is located around 40 kilometres southwest of the island’s capital city, Lefkada Town. The magnificent hills surrounding this beautiful beach are well worth the effort it takes to arrive there – which involves an exhausting but adventurous hike of 80 steep steps! But before you follow the track, it might be a good idea to buy yourself a frappe (the famous Greek iced coffee) from the snack bars you can find at the top of the hill so that you won’t find yourself thirsty half way! However, if you are not excited about this idea, there is always an alternative solution — just take one of the taxi boats available from the nearby towns of Nidri or Vassiliki for a magical journey. Porto Katsiki provides a range of water activities including swimming (of course! ), sailing and surfing. 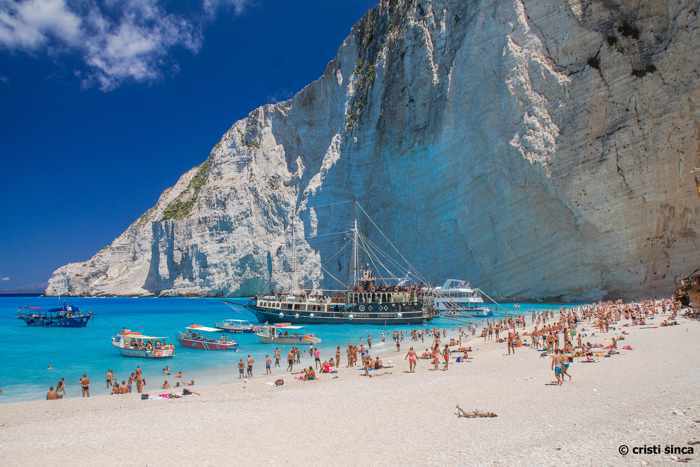 Situated on the north-west shore of the island of Zakynthos, Navagio beach — also popularly known as Shipwreck beach — is one of the most photographed beaches in the world. And this is not random at all, as the steep limestone cliffs, white sands, crystal clear waters and the incredible abandoned shipwreck stuck on the sand create an astonishing scenery. The location is also a favourite spot for base jumpers, as the view from above is mesmerizing! You can only access the beach by boat, unless you are a base jumper, in which case you can jump from the cliff and smoothly land on the soft sands! With its golden sands spread for more than 5 kilometres, Faliraki beach in Rhodes is one of the most beautiful on the island. As a very well organized beach, Faliraki will keep you busy and satisfied with its wide range of services and activities provided. Umbrella and sunbed rental is available, while you can also find a variety of water activities such as bungee-jumping! Furthermore, the area doesn’t lack of any good restaurants, night clubs and cafeterias. Bear in mind that the beach gets crowded, so it’s a good idea to wake up early in the morning if you would like to secure yourself a spot near the shore. However, if you are on hangover from having too many cocktails the night before, then you can take a nap at the beach while sunbathing! Just remember to put your sunscreen on, as you don’t want to wake up later with sunburns! 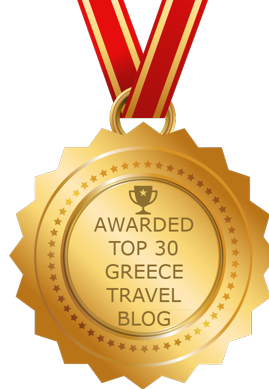 To check out some of the best places to stay in Faliraki, click here. Golden Beach (Chrysi Ammoudia) is a long coast with golden sands, and it is without a doubt the most beautiful beach of Thassos Island. The shallow waters are so transparent you can see the bottom of the sea and all the little fish swimming there! The scenery is magnificent, as the beach is framed by little cliffs and green trees reaching down the sea, while Mountain Ypsarion arises over the bay, creating an irreplaceable view. As a very well organized beach, it is also a popular destination for families with small children. Check out the best places to stay near the beach by clicking here. 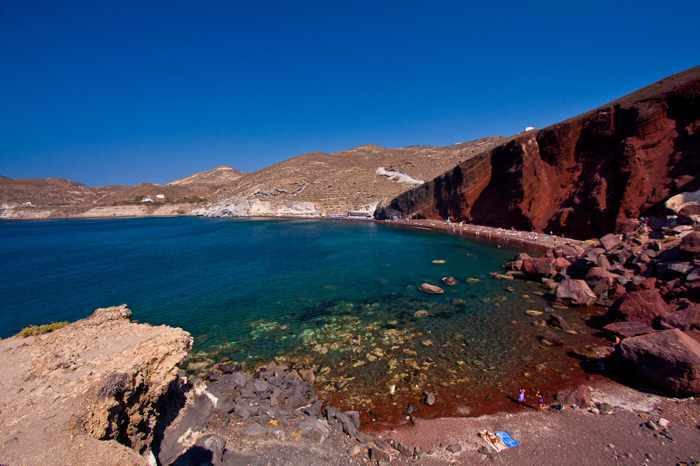 Situated in the most popular island of Greece, the Red Beach is famous for its unique colour of sands and the stiff red lava cliffs surrounding it. It is blessed with a beautiful sandy shore, clear blue waters and big rocks sitting around it, creating a magnificent scenery that would make you want to spend the whole day there! The beach is near Akrotiri area, and we suggest accessing it by boat which you can board from the areas of Perissa or Akrotiri. Otherwise, if you prefer walking and hiking, then you might as well reach the beach by foot, which is just 10 minutes away from Akrotiri. Christofer Adam is a Content Marketing Executive at London’s leading Online Marketing Agency, passionate with Social Media, Creative Writing and the Travel Industry. Click here to view his profile on LinkedIn.